Immer wieder hübsch anzusehen: die Blüte von Passiflora ‚Mantega‚, eine meiner selbst gezüchteten Hybriden mit Registrierung (#169). Die Eltern dieser Passionsblume sind Passiflora ‚Manta‚ von Maurizio Vecchia, und Passiflora megacoriacea, die ich aus Costa Rica mitgebracht habe. Passiflora ‚Mantega‘ bildet etwas unregelmäßige Blüten, da die Corona-Fäden bei manchen Blüten fast gerade verlaufen, bei einigen dagegen geschwungen sind. Der dezente Duft dieser Passionsblume erinnert mich an Zitrone. 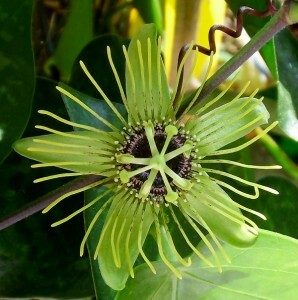 Ihren Duft hat P. ‚Mantega‘ von der männliche Elternpflanze, Passiflora megacoriacea. Letztere duftet sehr intensiv nach Zitrone, wesentlich stärker als die Hybride und scheint diese Eigenschaft stark zu vererben, denn auch meine zweite Hybride mit Beteiligung der P. megacoriacea, Passiflora ‚Albert‘, duftet stark. Von beiden Elternpflanzen hat Passiflora Mantega ihre charakteristischen Eigenschaften geerbt. Die dunkle, fast schwarze Blütenmitte ist der Mutterpflanze sehr ähnlich. Auch die Blätter sind eine Mischung aus beiden Elternpflanzen. Farbe und Panaschierung haben sie von P. ‚Manta‘, jedoch sind die Blätter wesentlich größer, so groß wie das Laub der P. megacoriacea. Always nice to see: the flower of Passiflora ‚Mantega‚, one of my self-bred and registrated hybrids (#169). The parents of this Passion Flower are Passiflora ‚Manta‚ by Maurizio Vecchia, and Passiflora megacoriacea, which I brought from Costa Rica. Passiflora ‚Mantega‘ forms a bit irregular flowers, as the corona filaments are straight with most of the flowers, but some are rolling. The restrained scent of this Passion Flower reminds me of lemon. 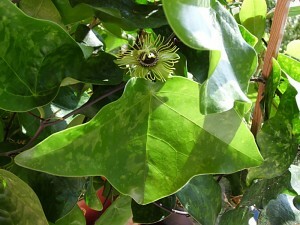 The Passi inherited its scent from its male parent plant, Passiflora megacoriacea. The latter has an intensive lemon fragrance, much stronger than the hybrid, and seems to pass on this property to its offsprings, as my second hybrid with a P. megacoriacea as a parent, Passiflora ‚Albert‘, has a distinct lemon scent as well. 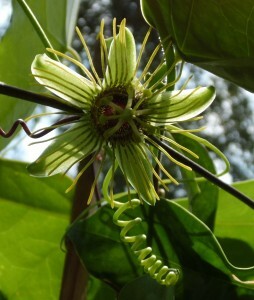 Passiflora Mantega inherited its characteristic properties from both parents. The dark, almost black center of the flower looks very similar to that of the female parent. Also the leaves of P. ‚Mantega‘ are a mixture of both parent plants. Color and variegation are similar to that of P. ‚Manta‘, but the leaves are much larger, such as the foliage of P. megacoriacea.